Deryn Blackwell has been called the “boy in seven billion.” When you hear his story of beating the odds against a rare form of cancer, you’ll understand why. In 2010, when Deryn was just 10 years old, he was diagnosed with leukemia. Two years later, his family received even worse news when doctors discovered that he was also suffering from Langerhans cell sarcoma (a cancer so rare that the odds of having it are seven billion to one). The prognosis for this spunky kid didn’t seem too promising. Deryn had endured three unsuccessful bone marrow transplants and he was in the process of trying a last-ditch fourth attempt. But during that treatment, a deadly complication arose when Deryn contracted a deadly superbug in the hospital that literally turned his fingers black and blue. Things looked so bleak that Deryn was only being kept alive by antibiotics since his weakened immune system couldn’t fight the bacterial infection off by itself. In fact, his pain was so great that he begged the doctors to amputate his hands. Both Deryn and his family began to plan for his funeral. As you can imagine, Deryn’s mother, Callie, was distraught. Physicians told her that her son had just three to seven days to live at most. But that’s when she decided to do something desperate. In an effort to ease his pain and suffering, Callie secretly gave her dying son a cannabis tincture, which she administered sublingually under his tongue. Seven years later, she credits that decision as being a turning point. Callie has since gone public about her decision to give Deryn the cannabis tincture at that critical juncture. But her actions have sparked controversy as well as hope. The Blackwells live in Britain and medical cannabis-based medicines have not been licensed for use in minors. Consequently, Callie feared that she could lose custody of her son if officials realized the truth. In addition, since coming forward, Callie has been accused by some of hyping the role that cannabis played in her son’s recovery at the expense of the bone marrow transplant and the antibiotics, which most experts credit with saving Deryn’s life. 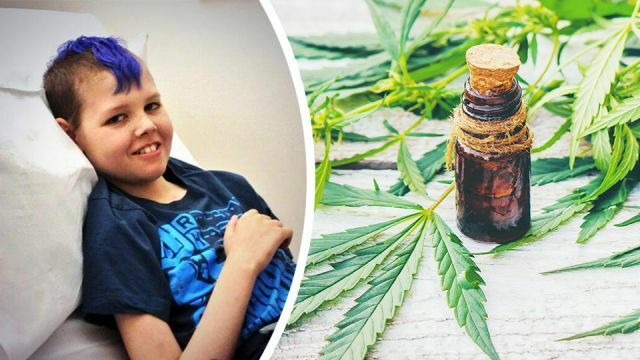 In fact, although the Blackwells have insisted that they believe cannabis played a role in Deryn’s recovery, they have not claimed that it cured his cancer. However, the family does believe that the herbal tincture helped boost his immune system at a critical stage, which somehow allowed the conventional treatments to take hold. In truth, no one can say with certainty what saved Deryn’s life. Even the family agrees he probably wouldn’t be alive today without that fourth and final bone marrow transplant, conventional drugs and surgery. But there is indisputable evidence that cannabis-based medications can alleviate the pain and nausea associated with cancer and chemotherapy. There’s also an increasing body of evidence suggests that cannabis does contain tumor-inhibiting compounds. In addition, recent research also suggests that the herb has a complex immune modulating effect insofar as it has a balancing effect on various components of the body’s defense system. More specifically, cannabis appears to have the ability to harmonize or correct imbalances between cell-mediated immunity and humoral immunity. In other words, the cannabis tincture Deryn took could have helped optimize his immune system. Everyone agrees that Deryn’s recovery was something of a miracle. The young man still faces health issues that are a consequence of his condition and his treatments (such as chronic fatigue and aplastic anemia). But he is doing well and dreaming of becoming a vegan chef. How do you explain a one in a seven billion medical miracle? Was it the conventional treatment, a mother’s love or the cannabis that proved decisive? In my view, it’s plausible that it was a synergistic combination of all three. Hey Buddy!, I found this information for you: "A Mother’s Son Was Dying From Cancer, So She Secretly Gave Him This". Here is the website link: https://www.thealternativedaily.com/a-mothers-son-was-dying-from-cancer-so-she-secretly-gave-him-cannabis/. Thank you.